Join the Sport Relief Challenge in Kendal for 2018. To get involved, head to Mintbridge on 23rd March and join our local community as we get together and raise money for Sport Relief, as part of the charity’s national ‘billion steps a day’ challenge. For 2018, the team behind Sport Relief are setting our nation a challenge of collectively achieving a billion steps every day from 17th – 23rd March. 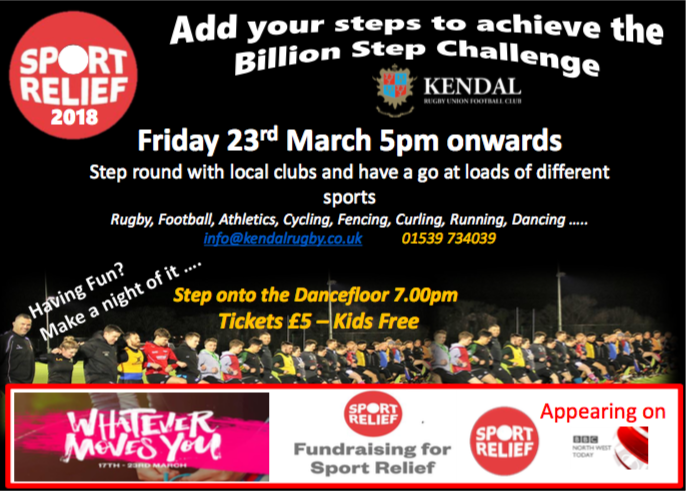 Kendal is supporting the challenge with sporting clubs, local residents, schools and visitors all invited to join in on Kendal Rugby Club’s pitch on 23rd March from 5pm. With a vast array of local sport clubs confirmed to attend, the event will provide a great opportunity to try your hand at a new sport; including football, athletics, cycling, dancing and fencing. For further information, please email Clare at info@kendalrugby.co.uk.